Of the 71% of respondents who reported their real estate company’s revenue grew in 2016, 41% reported their real estate company’s revenue grew by 10% or more, compared to 2015. Yet, 50% of companies reported their companies did not hire more people, while 22% reported that their companies decreased the number of people in their organization in 2016. If the U.S. economy heats up to the degree our industry-wide survey predicts, real estate’s need for more qualified talent could be a driving force in increasing compensation even higher in 2017. However, 2016 may be an aberration. 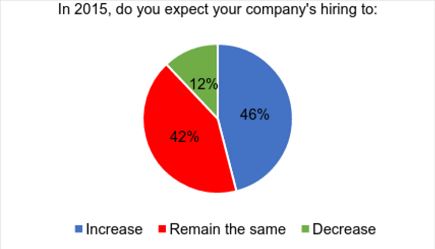 Looking back to 2015, 88% of respondents reported their company’s hiring would increase or remain the same as 2014. And they were right: real estate hiring reached record levels in 2014 and 2015, after a 5-year hiatus from 2008 to 2013 as our industry waited to recover from the global financial crisis. By 2016, most companies had recently hired and were waiting to see what the election would bring. 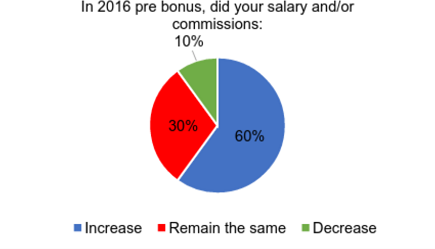 60% reported higher salaries and/or commissions in 2016, plus a whopping 69% of our respondents had received a bonus the previous year. In the war for talent, 14% of our respondents reported a 20% increase in compensation, while another 15% received an increase of more than 10%. The price for top talent in 2017 could push the needle even higher. 70% expect their total compensation to increase in 2017. 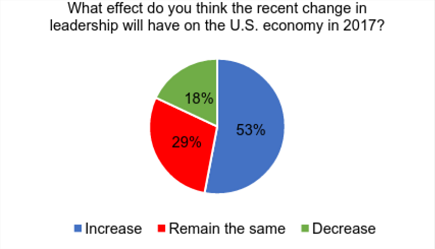 53% of respondents believe the change in leadership will have a positive effect on the U.S economy. 42% of respondents believe Foreign Relations will have an impact on their business in 2017. 2017 and hopefully by 2018 will have more positive outlook and growth of economy. Still need good and better jobs for majority of people so not to be underemployed. 2017 should be a solid year with increases in earnings and profitability (under 10%). KEY will be staying 1 step ahead of our buyers on the product enhancements we put into our homes (upgrades & amenities) or offer our buyers. Slim wage growth is a reality for consumers; quality of jobs being created must rise. Transition from a political leadership model to a business leadership model will be difficult for many in the ‘swamp’ of Washington–but the results that begin to show up by 3rd quarter will at least stop all the ‘waling’ on the liberal side. Cautiously optimistic, but wait and see. Changing market that presents new challenges but rising interest rates will help create equilibrium in hot markets across the country. If rates do not rise too quickly there will be plenty of opportunity. Complete unknown but suspect will try to be neutral to positive for business. Whether they will succeed is to be determined. Currently it is the unknown the markets hate uncertainly so Q1 is, I think, to wait and see then the rest of 2017 will be the reactions to policy changes. Rates will be going up so that will signal changes and opportunities. Excited and looking forward to the year. Expect positive growth and increase in portfolio size. Going to be a very successful year, 2017, ahead. As the business and personal tax rates will go down means more money will be in the pocket of employees and business leaders. More money means more spending, more investments and more growth in the real estate industry. The US economy will grow significantly since most of the foreign jobs will be going down and more incentives to those foreign companies investing in US. Dependency of the foreign oil is at the lowest level, and the most common people having more money to spend due to the substantial reduction in the oil prices. Not expecting a major change in the interest rate for mortgages during the year 2017, only slight changes. Hopefully, we experience an uptick. Hoping for 2017 to be a better year than 2016. Hopefully the positive economic growth outlook will have the similar effect on the expansion of hiring into upper level paying jobs. I believe 2017 will become a banner year for myself, the company and our clients. I think that the RE industry will be expanding dramatically in the next 2-3 years which in turn will create an increase in hiring across the board. It is going to be an exciting year if people begin to keep more of their own money and can gain confidence to spend some of it. This could be a major economic expansion if taxes decrease and other programs are implemented per the new administration. It will be a positive year with the culmination of everything in 2016 coming to an end and a trend developing for the next years to come. More housing demand, with continued constrained supply. Positive – with a business leader as President. The world is going through change, specially India. New reforms by US and India will be the market drivers and will have direct impact on business climate. This will be a tremendous year. Too soon to tell if having a real estate professional at the helm will help or hurt our industry. I’m trying to be hopeful that the new leadership will be a positive influence, both nationally and internationally! Trump will give the economy a great boost because people in this country and other countries trust him. Very optimistic! We’re seeing a strong pipeline of deals from developers and very strong interest/commitments from investors looking to come into our deals. Throughout this recovery, firms have been slow to hire, squeezing more efficiency out of existing staff in most cases. The dramatic happenings in DC will likely extend the recovery, if not improve it as well. But Trump has got to get off that Twitter. He looks like a joke on there. Hopeful that the economy and the commercial real estate sector will continue to prosper and that well-paying, thought provoking, and challenging career opportunities are plentiful throughout 2017. I am very optimistic for President-elect Trump to take office and start to repair the damage done by the last eight years of the Obama regime. Companies will continue to do more with less, and pass increased profits to shareholders rather than employees. I am a real estate manager at a major US airport. Trump has stated his interest in investing in our country’s infrastructure…and airports. I believe him, and his plan bodes well for the industry I’m in. I am not sure. Trump talks a lot and he doesn’t always mean what he says. This will have to be good timing on his part and if manufacturing grows because of sales. We have yet to see. It will be a good year for Chinese investment into US in 2017. Hold on. It’s going to be a wild ride. Has the world forgotten about the CMBS loans that won’t be able to be refinanced in the coming years? Is this looming CMBS problems and the exuberance of an overvalued market based on a real estate developer as president the perfect storm for yet another major melt down? Interest rates up, people cautious about expansion and hiring. My plans are to exploit other educational challenges such as IT, Project Management and the CPA. Lots of uncertainty will lead to high levels of volatility. Multifamily rent growth will slow to 4 % +/- vs the 10% will have seen over the past 2 years. Asset Managers that have solved the problems that occurred after the financial crisis will learn that they have worked themselves out of their jobs now that the problem properties have been fixed and sold. Asset Managers’ stars will start to fade as properties become fully leased and sold. The market is getting tougher year after year. Concerned about the future. US standing will wane as Trump assumes presidency. Infrastructure spending (if it happens) by Republican controlled government may bring back inflation and higher interest rates. What will keep the party going? Deregulation across all regulatory sectors will occur which may benefit real estate generally, but it is difficult to judge how the US economy and financial sectors overall will fare given the erratic and dangerous behavior of the President elect and his potential Cabinet. Going to be a rough one. I expect high levels of volatility in the capital markets. Fundamentals in the tenant universe will remain relatively strong, and demand for industrial space in key gateway markets will continue to rise. Our industry will not be affected by changes in the business fundamentals, but will be changed by a rising interest rate environment, rising nationalism around the world, high levels of volatility in the stock market, and an extremely opaque and unpredictable leader at the helm of the world’s largest economy. I expect the optimism in the business community following Trumps election will subside quickly after he takes office and just as quickly turn to an equally enthusiastic pessimism when the effects of his policies really start to become evident. I would not be surprised if the US moved into a mini recession by the end of 2017, though I would not expect the recession to last very long or be very severe in the context of the last 30 years. Hoping for the best; preparing for the worst; waiting for the “other shoe to drop”. I am a mortgage underwriter. Business is good. Automation has eliminated the need for so many people to do processing/underwriting. Rates are still very low for refinances but higher rates mean less purchases. I see tremendous credit card debt and student loan debt, but salaries do not support so much debt. Borrowers appear to be underemployed. Housing prices appear stable except in California, where bidding wars still occur and prices are rising too rapidly. Look for consumer debt to bring the economy down and another housing bubble burst in California. Happy New Year!! I am very concerned with the impact the new administration will have on our economy and how far America has come. My fear is we will take a quantum leap backwards. I think that homebuilding should remain stable, however multifamily might find itself in a more tenuous position. It seems like banks are getting a bit more nervous about cap rates finally moving the other direction, and I’m not confident that institutional money is going to have the same appetite for multifamily developments at the end of the year. I think we will see volatility in the markets, specifically as it relates to backlash from uncertain outcomes in the area of foreign relations as well as volatility due to the response to some blatant violations of the constitution of this country. I think that the FED will raise interest rates and there will be an uptick in inflation. If Trump gets to fully install his changes, markets and economy will enlarge for next 2 years and then crash extensively leading to another great recession. Mixed bag…. too much uncertainty, no real clear direction. More borrowers will look to refinance properties before rates increase too much where borrowers have typically been rewarded for sitting on fence as rates have stayed relatively low. Positive impact on the economy in the short term, although long term I expect deficits to increase along with inflation and interest rates. Deportations, if they happen, will lead to labor shortages and recession. The stock market will eventually revert to the mean. Positive job growth in DC. More international investment in DC. Makes the region safer. A lot of political turmoil. More political division. I was laid off in November from a Land Planner position with a large Rocky Mountain ski resort that appears to be positioning itself for sale. I am in my late 50’s. I survived the real estate collapse by becoming a PMP doing environmental planning (NEPA) work for the Fed’s under a 4-year term position. I took my most recent Planner position following the completion of the 4-year term at about half of my past salary. I am becoming pessimistic that I can regain my pre-2006 career position this late in my career. The Bush Administration in 2007-2008 placed the economy in a major recession (near Depression) status. Being an Economic/Business Administration/Real Estate professional for over 42 years and being rated as top 1% in the country in sales/marketing of commercial real estate sales/development. I feel that the Obama Administration tried desperately to help Middle/Low Income including college age “Millenniums” to sustain the Roderick and abuse of the Congress has imposed upon one of the best President’s in history. I will feel more confident in the President Elect (Trump) administration once he submits his current and past (tax) information. Corruption is one thing that will hinder or ruin this country. We are on our way to a fine start! The 25% who voted for this gentleman, are living with “Visions of Grandeur”. No knowledge whatsoever on issues about the economy or what steps need to be taken to move forward in a positive venue. God be with us all through the next (4) four years and this new administration! The first month, January until March 31 will find positive financial results. After March 31, the USA will incur such a harsh financial crash never experienced. The financial crash will affect the real estate market so severely that business will depart from the real estate market as an alternative investment strategy. Accordingly, negative interest rates will be imposed by the Federal Reserve in a failed attempt to keep the country afloat [with little success]. The new president is obviously the biggest game changer in all aspects of business and our lives. I strongly believe that the next few years will be some very strong, high-growth years. However, just like with Reagan (S&L crisis) and George W. Bush (financial crisis), it will all end very badly. Just how badly remains to be seen. But in the short term (couple of years) business will be propped up through lower taxes, higher deficits, and higher debt that will ultimately have to be dealt with by the next administration. There’s good reason for the overall negative outlook on business locally & beyond in the year ahead. It’s an ugly forecast and we think it will get much uglier before 3rd quarter ’17. Trump’s complete lack of foreign policy, military or govt experience will lead us into more and more severe armed conflicts, possibly even outright war. It’s terrifying. Volatility will be front and center through the asset management process (buy, develop, hold, sell). High cost of living along the coast will make it even harder to place talent in already tight markets; wage growth has not kept up with costs. Capital Markets may benefit from banking policy; however, benefits will not be felt in the short-term (costs are too high in coastal markets). While Trump could be good for the economy it also creates uncertainty that is making everyone including home buyers nervous. A big unknown. The new president’s overall approach seems to be transactional rather than strategic, so there’s no way to know what his policies would be until they are announced or implemented. Our firm is very sensitive to international affairs and relations, because all our investors are from overseas. Things will be in flux so I’m retiring from my present position and going out to look for the next opportunity. There appears to be a backlog of new projects with a result of construction pricing still increasing, however it also appears that Lenders are tightening on new loans. 2nd and 3rd quarters of 2017 should be interesting, as I suspect a change in markets. The economy is still in recovery. Conservative until Trump policies start. Will take 2-3 years to realize any benefit from the new administration, a real up turn to past 8 years! Hoping for the best, but preparing for a year that could be filled with unknowns. Mixed thoughts – president elect has not been approved. Then what good does it do if people immediately try to disqualify the election. Interest rates should have gone up a long time ago and now it will be telling to see how the increase in debt service to the US impacts programs the new (for now) administration purports to put in place. Way too much of the self-righteous crowd out there to get a good feel on what is going to happen. One thing for certain – get the government out of the business world and allow the markets to clear. That will be key. Happy Holidays. Unpredictable new President to be held somewhat in check by Republican Congress. It will be a very interesting four years. 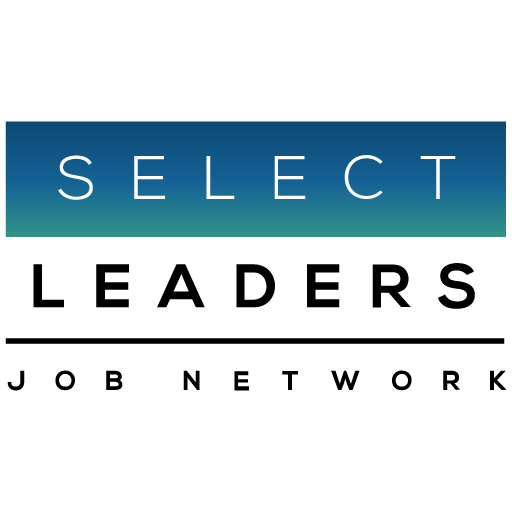 Methodology: The survey was emailed in the last weeks of December, 2016, to registered Employers and Job Seekers who have opted-in for emails on the SelectLeaders Real Estate Job Network. The survey was conducted using a web-based survey program.